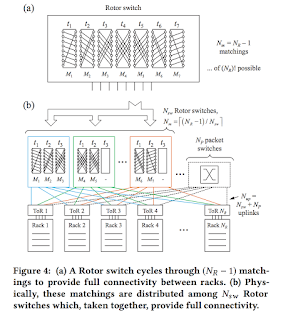 William Mellette proposes a new switching model called RotorNet, which is a "future-proof" switching model. Bandwidth has been increasing in production data-centers, and 100+ petabit/second networks are projected to be needed in coming years. The challenge is to deliver low-cost bandwidth at scale. 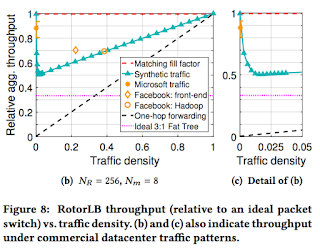 This has spurred work for new protocols, new topologies, and new hardware. However, all this work has fixed the switching model. Bandwidth demands for data-centers are doubling every year, and our current switches are not improving fast enough (doubling every 2 years). 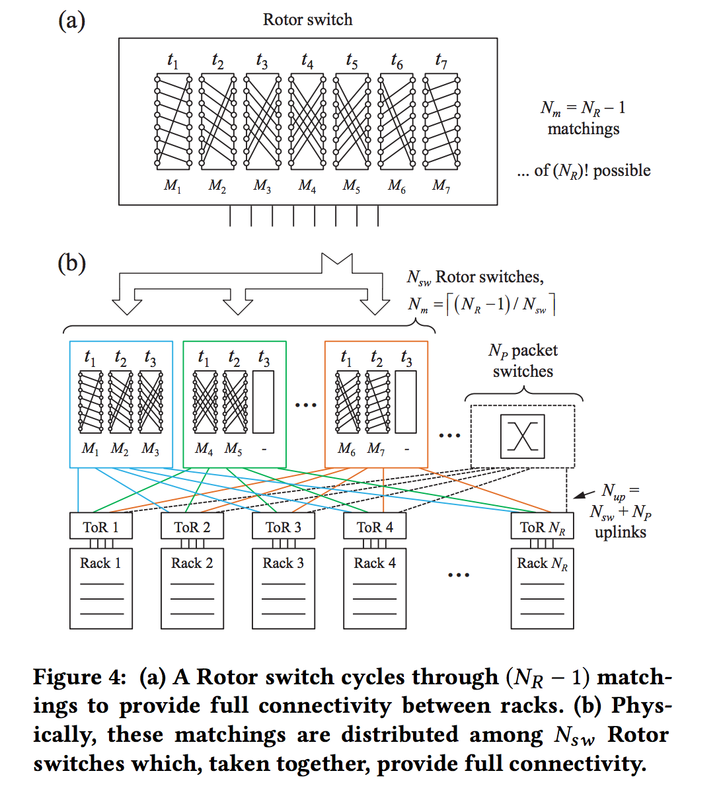 Electronic packet switches have I/O limits, whereas optical circuit switches can scale to Tb/s. For an N-port switch, the switch can only select from N-1 matchings. The switch's matchings are run on a fixed schedule. 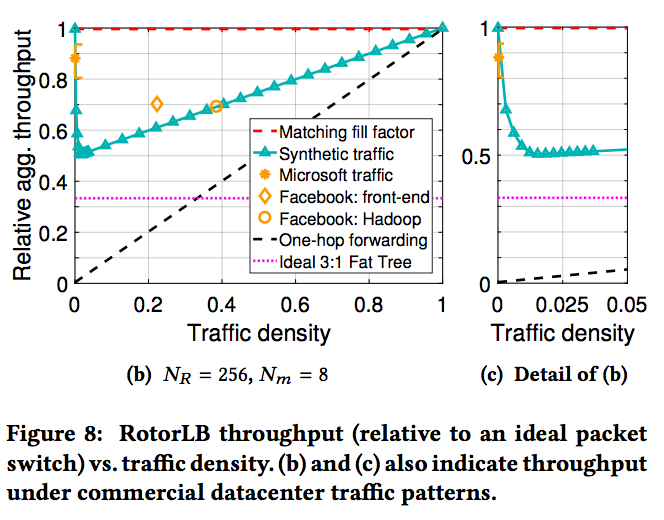 To wrap up, RotorNet is a promising way to scale datacenter networks to the bandwidth that we will need in the next few years. Q: How do the switches stay in sync? A: We just need to ensure synchronization between the switches, and they follow the set schedule for rotating matchings. Q: What is the ordering of packets that are transmitted? A: There will be reordering (due to traffic taking 1 or 2 hops), our approach is to have a reorder buffer at the receiver. Q: What is the format that packets are stored in buffers? A: We hash the packets to be stored on the end hosts. Q: How do you do 2000 ports? Do you still only use 2 mirrors? 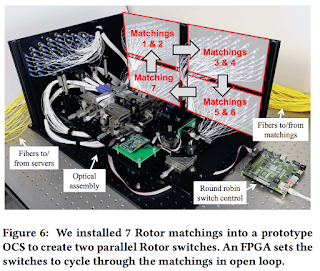 A: There are a number of different ways to implement the rotor switch at the physical layer. At 2000 ports you can have a large mirror or a mirror array. Options are being investigated.